Block 7 and other fun stuff! Block 7…we are over the halfway mark! I love the way these blocks are coming together. The pattern for this quilt is called “Hugs and Kisses”, designed by Sue Garman. If you are part of this BOM that started 7 months ago, your quilt is going to look like this. I am making the blocks again, but in a different colourway (pinks and browns). I think I am going to do something a little different for the sashings and I may not add the swags, but then again, maybe I will. So much fun planning a quilt as you go, getting a feel for what the quilt needs. There has been some excitement at our house. It’s been well over a year since we lost our Jenny. I swore I would never get another dog…and then this happened! We adopted Kira and Chiqui from Dog Tales in King City near Toronto. Their ages are estimated at about 2-4 years old and they come from Miami. Dog Tales Rescue and Sanctuary is an amazing place to visit, even if you are not looking for a dog. Check out their website here. I must say both Kira and Chiqui are fitting into our family quite nicely. And, yes…Bruin approves! Bruin won’t admit it yet, but he loves the company. Notice the quilt blocks? Hubby and I are going to the Yukon for 2 weeks in late August, so the last 2 blocks are prepped but not stitched. I am saving some stitching so that I have something to do while we are on vacation. 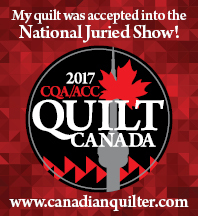 Sounds crazy I know, but most quilters can relate. I will be teaching 2 classes at the upcoming Academy of Applique in early March 2019. I cannot say enough about the Academy and I hope you will consider joining us next year. I’d love to show you my class samples that I am working on, but we are sworn to secrecy until the Class Catalogue comes out on Saturday, August 4. Registration opens up on Labor Day, September 3 at 12 noon. Mark your calendars! Yesterday I spent the day making freezer paper templates so that I can start prepping one of the Academy projects today. In my spare time, I am still working away on the “I Spy quilts” I am making for our 2 granddaughters. The pattern is Smitten by Jen Kingwell and instead of doing English Paper Piecing, I chose to piece by hand. To say I am now obsessed with handpiecing is an understatement. Every year my friend Kathy W. and I buy a piece of fabric and split it in half. Some years it’s a whole bolt that we split and sometimes it is just a couple of meters. The white fabric with the coloured dots at the top of this photo and the left side is the challenge fabric from a few years ago. To he honest, some years we buy the fabric and don’t do anything with it (we like to say our ideas are still “percolating”) but I am determined to use up every inch of this fabric on these I Spy quilts. So I am just quilting 1/4″ away from each seam. I started out marking each stitching line, but not I am just eyeballing it But I am marking the diagonal lines I am quilting in the side triangles. So much fun!